The ID Tech OmniFare has been discontinued. No direct replacement is available. 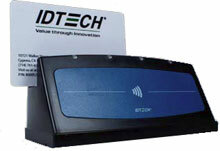 The new IDTech OmniFare now reads MIFARE proximity cards. The OmniFare is a hybrid device that is capable of reading all three tracks of magnetic stripe data and MIFARE media. OmniFare is a rugged, weatherized reader with a small footprint and is ideal for outdoor usage. There are two serial communication interface options, either a high-speed 2.0 USB-HID interface or an RS-232 interface which provides standard COM port operations. Its unique dual head design improves your customers' experience by ensuring first time reading reliability by reading cards being swiped regardless of their magnetic stripe orientation. MIFARE proximity media is quickly read by simply waving/tapping the media on OmniFare's conveniently sloped reading surface.